GBR Helicopters is the one of the largest and most experienced Cairns scenic flights & helicopter charter companies. GBR Helicopters provides Cairns helicopter tours and scenic flights over a range of destinations in Far North Queensland. 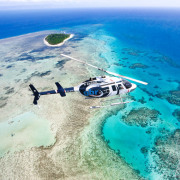 One of the most respected helicopter charter Cairns companies, GBR also specialises in aerial cinematography and Great Barrier Reef resort transfers; among other Cairns commercial helicopter services. Since 1996, GBR Helicopters has been prioviding daily helicopter tourism services to cruise operators at the Great Barrier Reef. 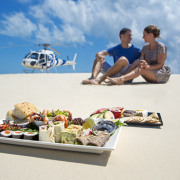 They are the only helicopter operator to provide an exclusive, contracted daily service to the four major Great Barrier Reef day tour operators – Great Adventures (GreenIsland, Norman and Moore Reef), Quicksilver Connections (Agincourt Reef), Reef Magic Cruises (Moore Reef) and Sunlover Reef Cruises (Moore Reef). 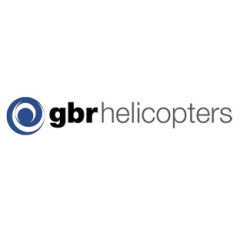 GBR Helicopters employs approximately 50 staff. 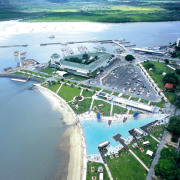 The company’s headquarters and licensed maintenance facility are located on the General Aviation precinct of Cairns Airport. The company also operates out of bases in the Cairns CBD, Port Douglas & Horn Island in the Torres Straits. Sandy Cay Brunch - Romantic!